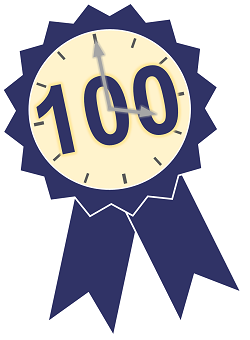 The 100 Hours Recognition Scheme aims to recognise the valuable contribution that volunteers are making in Salford by awarding a Certificate of Recognition signed by the Ceremonial Mayor of Salford for those who have given 100 hours to volunteering. This is one simple way of thanking your volunteers for all their dedication and hard work. 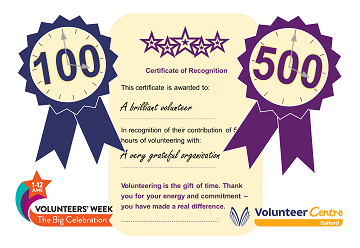 As part of Volunteers' Week last year we launched our 500 Hours Recognition Scheme. The 500 Hours Recognition Scheme acknowledges the huge committment of many volunteers in Salford. The extra special Certificate of Recognition is also signed by the Ceremonial Mayor of Salford for those who have given 500 hours to volunteering. At the Heart of Salford Awards 2017 we launched our 1,000 Hours Recognition Scheme. 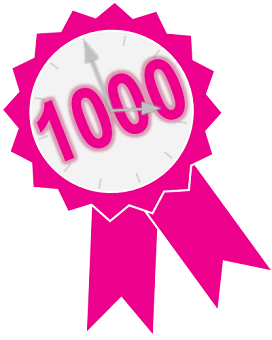 The 1,000 Hours Recognition Scheme acknowledges the dedication and commitment of volunteers in Salford. This special certificate is also signed by the Ceremonial Mayor of Salford. There’s no limit to the number of volunteers each organisation can register. To be eligible for a certificate, each volunteer needs to have completed either 100 or 500 hours of volunteering. Please complete this registration form for 100 hours, this form for 500 hours, or this form for 1,000 hours ensuring all details on the form are completed, along with signatures from yourself and the volunteer. If you are registering more than one volunteer, please complete a separate form for each volunteer.